Hardcover. 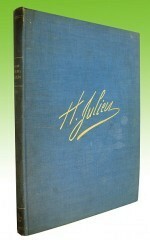 Montreal, Librairie Beauchemin Limitee, 1st, 1916, Book: Very Good, Dust Jacket: None, 206 pages, large format hardcover, blue cloth covers with artist's facsimile gilt signature on front. Julien was the Canadian Charles Dana Gibson or James Montgomery Flagg. A collection of his caricatures and political cartoons from the Canadian press, late 1800s and early 1900s. Light shelf wear to covers, interior crisp and clean. Text in French and English.